Renée Firestone, Jewish Auschwitz survivor; her life story was part of Steven Spielberg’s Oscar-winning documentary The Last Days. Richard Rudolph, Bible student (one of Jehovah’s Witnesses) and conscientious objector; as “A Victim of Double Persecution” he spent almost nineteen years in Nazi camps and German Democratic Republic prisons. Adolf Burger, Jewish Auschwitz survivor & counterfeiter in Sachsenhausen concentration camp. Leopold Engleitner, Bible student (one of Jehovah’s Witnesses) and conscientious objector; who at 107 years old, was the world’s oldest known male Nazi concentration camp survivor and Holocaust teacher. When hatred, prejudice, and bullying threaten, whose voices will we turn to? The voices of the survivors must never be silenced even if they are no longer among us. 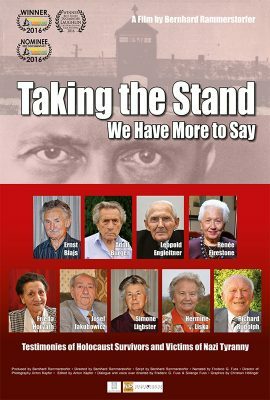 Nine Holocaust survivors and victims of Nazi tyranny [Jews, Jehovah’s Witnesses, Sinti, and a political prisoner] from 5 different countries (Austria, Czech Republic, France, Germany, USA) have ‘taken the stand’ to give their testimony as a legacy for future generations. All in all, they were interned in fifty-four camps or institutions, they were imprisoned for 44 years, and all together they can provide outstanding life experience totaling 806 years. Those whose voices are heard range from an average housewife to active Holocaust teachers and even the subjects of Oscar-winning films. Survivors were interviewed according to a catalog of questions, unique in the world, consisting of questions from schoolchildren and students from 61 schools and universities in 30 countries on 6 continents.